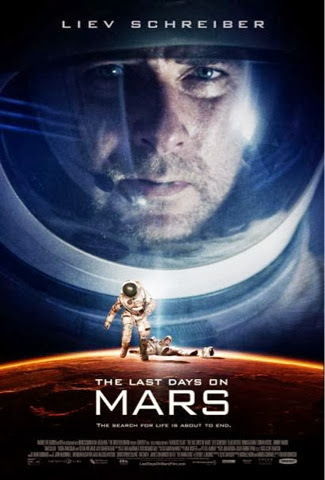 The Last Days On Mars is a sci-fi horror thriller starring Liev Schreiber, Romola Garai, Elias Koteas, Olivia Williams, Johnny Harris, Goran Kostic, Tom Cullan and Yusra Warsama as members of a rotating science team based on Mars on their final nineteen hour shift before they are to be relieved by a new team and return to Earth. Obsessed with the possibility of finding a possible remnant of life in the red sands of Mars, two scientists sneak out against orders to quickly retrieve samples and end up unleashing a virus that takes over sentient organisms to the point that it is implied that the host conscious of the infected becomes a prisoner within his or her own body. Then after death the virus reanimates the body of the infected and turns it into a rabid flesh eating ghoul. This is where the film loses it's wonder factor for me because with the rich attention to detail and attempt to create a believable near future colony with none of the cliches like having sound in a vacuum or a form of magical artificial gravity, to basically make a zombie flick out of this felt like a let down. Unless it is The Walking Dead or something directed by George Romero, I think zombie horror has become as cliche as vampires. The screen direction by Ruairi Robinson is capable for his feature film directing debut and cast members like Liev Schreiber and Elias Koteas help keep the tone from falling into schlock, but ultimately this is a film that is trying to walk the fine line between science fiction thriller and sci-fi horror and is only partially successful at both. It is not a jarring transition, but it is not exciting. That is not to state that it is boring. It is not a dull film, but it is a bipolar film that never captures the right balance between science fiction and horror. This should have been more akin to Alien in terms of creating a believable science fiction environment that contrasts and mixes well with the horror elements in that feature and the funny thing is scientifically Alien is less accurate than The Last Days On Mars, which has already been given a limited theatrical release abroad and will be opening in select theaters in the U.S. On December 6, 2013, but you can rent it out now on demand through services like i'Tunes. The film has great effects and a good cast as well as nice screen direction for a first time feature length film director. Overall on it's own The Last Days On Mars is an okay film, but not a great one. The premise is not carried far enough to frighten or disturb other than the implied idea of not being in control of one's own body and reanimating after death, but it doesn't take the horror elements far enough to elicit a true visceral response, which is what the film desperately needs to make it stand out.